A Junk-Foodaholic's Journey to a Healthy Lifestyle: Who Sells the Biggest, Baddest Burgers? Who Sells the Biggest, Baddest Burgers? 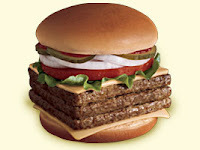 This is a Hardee's Monster Thickburger. This bad boy takes home the prize as the biggest, baddest burger. 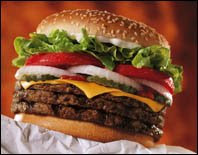 Next comes Burger King's Triple Whopper with Cheese. It's a whopper all right! 1,230 calories, 52 grams of carbs, 82 grams of fat. This 'modest' offering comes from Jack in the Box. It's called a Sirloin Bacon 'n Cheese Burger. 1,120 calories, 63 grams of carbs, 73 grams of fat. This is the illustrious Supersonic Cheeseburger. Now you know why the Sonic girls have such big biceps, having to lug this big boy around. 980 calories, 58 grams of carbs, 64 grams of fat. This is Wendy's Triple with Cheese. I don't see how people can open their mouth this wide. 980 calories, 38 grams of carbs, 59 grams of fat. And though McDonald's Quarter Pounder with Cheese looks kind of puny compared to the burgers above, he packs quite a punch. 740 calories, 40 grams of carbs, 42 grams of fat. What's really bad is we don't just order a burger. We want fries with that, and oh yeah, don't forget the Diet Coke! So if the calories were listed on the menu board, do you think we would make healthier choices? 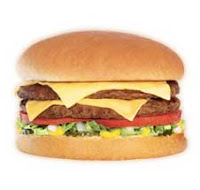 Labels: Calories, Hungry for Facts on Fast-food Calories, Junk-Foodaholism, Who Sells the Biggest Baddest Burgers?